Mobile Storage Trailers - Your Other Warehouse, On Demand! Yes, these are the trailers you see behind trucks on the highway, sometimes called tractor trailers. and they're spectacular for use as temporary or permanent warehouse and storage space. They provide large, clean storage areas, and can be easily moved or positioned right at your dock. If you don't have a dock, no problem. We can provide staircases for use at ground level, too. And, with four trailer sizes to meet your needs, they’re the perfect onsite storage solution for any company, from large construction sites to small work lots. Available for rent or lease, mobile storage trailers from Xtra Storage are a portable, convenient, and effective onsite storage solution. 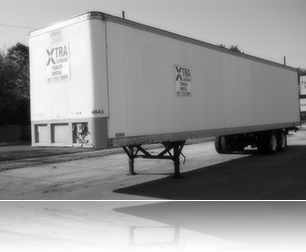 Call 937-253-0004 NOW (24/7) for an IMMEDIATE quote to rent or lease a mobile storage trailer!